The Standard Iron Works were founded in New York City by Harry Rosenbaum (1880?-1921) approximately 1906 and were located at 540-550 W. 58th St. from 1913 to 1917. This ad from 1911 represents the foundry earlier in time when they were located at 157 W. 29th St. This ad from 1915 represents the foundry when they were located on West 58th St. This ad from 1918 represents the foundry when they were at 508-510 E. 74th St. They were located here from 1917 to 1950. Harry Rosenbaum died suddenly in 1921 as recounted in the New York Tribune, 10 Nov. 1921, pg. 10, "Harry Rosenbaum, thirty-nine years old, president of the Standard Iron Works, 508 East Seventy-fourth Street, was killed yesterday when he either fell or jumped from a window of his apartment on the fifth floor of 894 Riverside Drive. Rosenbaum resided with his wife and three children, but they did not know of his death until the body, glad in pajamas, was picked up by Karl Soderstrom, superintendent of the building, at daybreak. Rosenbaum had been in poor health for two years." Harry Rosenbaum's birthdate is uncertain. In 1918 he registered for the World War I draft when he said that he was born 4 June 1879. His obituary notice in the Times says that he was 39 when he died. Assuming his birthday was in June, he would have been born 1882 if he died age 39 in October 1921. His death certificate says that his age was 41 when he died. This would mean he was born 1880. Following Harry Rosenbaum's death in 1921, direction of the company was assumed by his brother, Adolf Rosenbaum (1883-1945), and his widow, Mary Rosenbaum (1883-1944). The company stayed in business until the late 1950s. All of the Rosenbaums above were immigrants from Austria/Hungary. Adolf Rosenbaum's 1942 World War II draft registration specifies Ung County, Hungary. Ung County was on the northern edge of Hungary and following World War I most of it became part of Czechoslovakia. In the 1930 U. S. Census Adolf Rosenbaum's place of birth was recorded as Czechoslovakia. 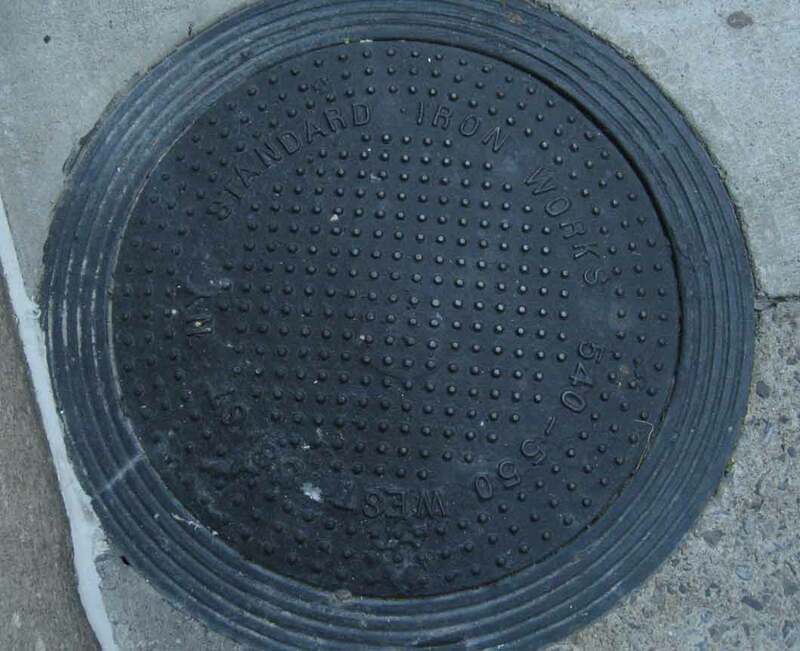 This coal chute cover for Standard Iron Works found on Willis Ave., the Bronx, seems to relate to a much earlier business with the same name but different owners and different locations. The only readable part of the address here is "618 W," which was 618 West 25th Street. This was the address of Standard Iron Works approximately 1891-93. The owners were the McCaffrey brothers, William H. McCaffrey and John J. McCaffrey. New York city directories do not use the name, Standard Iron Works, for this business. Rather, it is either W. H. & J. J. McCaffrey "railings" or McCaffrey Bros. They are listed under these names in the brief period 1890 to 1895. They did, however, use the business name Standard Iron Works in ads placed in the Real Estate Record and Builders' Guide. See, for instance, https://rerecord.library.columbia.edu/ May, 1891. I would like to thank a correspondent who lives in the neighborhood of the later Standard Iron Works' 74th Street address for alerting me to the Real Estate Record and Builders' Guide information.